098.Andrei Thomaz & Martin Heuser – JavaMuseum 2010 – Celebrate! Visual artist and developer, Andrei R. Thomaz is graduated in Fine Arts by UFRGS and hords a MFA by ECA/USP. Martin Heuser is a composer and artist born and raised in Brazil. 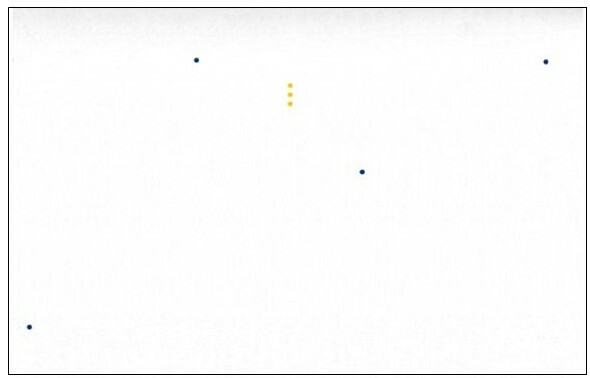 This work shows one of the pages from the book The Language of New Media, by Lev Manovich, through which several small red circles move. Each circle is accompanied by a sound. As different circles keep appearing, new loops of sound are played simultaneously, resulting in an ever more complex musical texture, which is never constant due to the different durations of the loops. 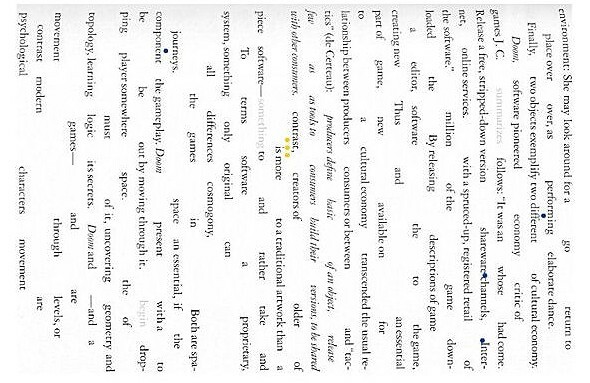 Visually the work attempts to reveal the pattern formed by the empty spaces amog the words of a text page; this pattern is rather labyrinthic and similar to urban maps. The use of sound aims at reinforcing the labyrinthic experience by presenting melodies that at first are recognizable, but that become entangled in a mass of sound as the work progresses.